Nemo is a cat that showed up at our door at 2:30 am scratching to come in (year 2004). I let him in, picked him up and fussed at him for being outside...My kids came to see what I was doing and I told them I was fussing at Simba for being outside. My daughter said "umm mom, that's not Simba". I was like, "yes it is, look." I then realized the cat I was holding was all cream colored where Simba is buff and white. So I turned the light on and sure enough, it was not Simba. Feeling kind of silly I put him back out side. The next day he was still there, we then took him in and tried to find his owners, but no one claimed him. We named him Nemo because he found us and we took him in as one of our own. It was the best find we ever had. Nemo is everyone's dream, he was a real live stuffed animal. His fur was as plush as the softest plush animal and he just loved everyone. In 2008 Nemo got out of the house one day and we couldn't find him, we were so scared and looked everywhere, put up fliers, etc. No luck. 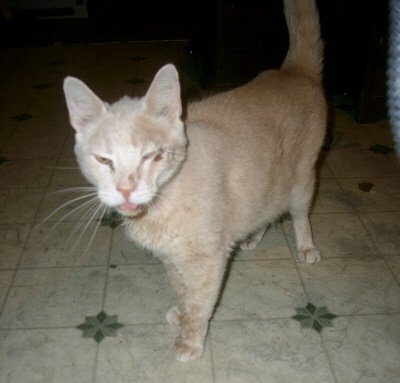 3 days later I heard a cat meow by my window, I thought it was one of our indoor cats, but I kept hearing it so I went out to make sure there was no cats outside and I was in complete and udder shock, it was Nemo, he was skinny, his jaw was broken and his eye was hanging out. I scooped him up, started crying and called the vet. The vet met me immediately. Once the vet looked him over it was put to us, to put him to sleep would cost $65 on top of the $75 emergency visit. And I was like, ok, how much to fix it, make him better I didn't want to euthanize him. So on top of the $75 emergency visit, surgery to remove his eye and wire his jaw would cost $650. Nemo got his surgery, there was no reason for him to die when he could be saved. We had many sleepless nights getting him through it though, he had trouble eating, learning how not to mess with his jaw, it was a long road for us, but we loved Nemo and it was worth it. January 2010 Nemo was ripped from our home by a conspiracy that went down between Animal Control and the Department of Child Services. You see someone called in lies on my family in December 2009 to CPS. On December 21, 2009, the caseworker unsubstantiated the allegations, but before she did that she asked if we would agree to her opening a case on us, to get us funding for somethings we were doing, we said no. She came back 3 weeks later, with more lies in which I confronted her about and she did not deny the fact she was lying to my face, again on 1/6/10, 1/7/10/, 1/8/10 and 1/11/10 asked us again if she could open a case on us, again, each time we said no. She then said she could get us a grant to remodel our home (that is what we were doing), she said we could get a new kitchen floor, get new kitchen cabinets, furnace, etc. We said no, we didn't need any help. She left only to come back 2 days later to take our kids and our cats. She went to her supervisor and the director of DCS (Indiana Department of Child Services) and told them were were cat hoarders when in fact we ran a no kill cat rescue. The ACO stood in my living room commending me on a job well done. Then as he went to leave he looked at the caseworker then all of the sudden it all changed. No matter what I offered to prevent the seizure he refused it. Little was I aware that a conspiracy just took place, I began to second guess myself, but I knew that it did not make sense. I knew once I went before the judge I'd get my cats back. Oh by the way, he left the 80 pound Labrador Retriever, and 2 chickens. He also left behind a cat in which he knew he left and that cat got pregnant because the caseworker made us put our Lab, my unfeathered chicken outside in below freezing temperatures, I didn't dare bring the cat back in while my kids lives were in limbo. We waited and waited to go in front of a judge and it never happened. Those cats, 15 of them were killed on 2/1/2010. The ACO said in court he euthanized all 15 cats because I never returned for them (because I was doing as told, waiting on a bench warrant). So essentially animal control stole my pets and killed them. DCS wanted us to prove we were not cat hoarder, they dismissed their case based on the vet bills I they asked for. I filed a tort claim (intent to sue) against Harrison County Animal Control, Harrison County Commissioners and the Harrison county Council in February 2011 (after finding out the ACO lied in his probable cause affidavit and no due process). In November 2011 I was raided again, this time they took all the animals I own! This time, it was reported that he euthanized my cat (the one I told him if she died in his care I would sue him, she was the first), the ACO also stated that I could get the aanimals back provided I paid the bond for them because no criminal charges had been brought forth and that I only had a few days left to do so. I then filed an injunction over the animals, then 4 cats died within 16 days of that and then my husband and I were charged with the death of these cats. Fastforward a year, a chicken has also died. I do not want this to happen to another family again, this is where Nemo's law come into play. Under Nemo's Law NO animal control officer will never be allow to seize your pet on the spot and no raids will be able to take place. There is alot of changes that Nemo's Law will bring forth to not just protect your pets life but to protect you as well. This is just the start of the change my family wants to make, what we have gone through, the pets we have lost we do not want another family nor another rescue to go through this heartache. We currently have a lawsuit against CPS, Animal Control and a few others that were involved in the 2010 case. We need help funding our attorney. If we win this lawsuit we are going to put up a legal fund to help others adversely affected but such government officials. This is our Paws Off Our Pets fund. Our attorney fee is $10,000, any amount paid into the fund that is not used to keep our lawsuit going will be put in the Paws Off Our Pets fund. Why help us pay our attorney? Because that is the only hope we have of funding such expensive attorneys to help others fight injustice that has come their way. By helping us keep our attorney on the case we will pay forward your donation to start this fund and get Nemo's Law inacted to stop the needless suffering of innocent people and their pets.